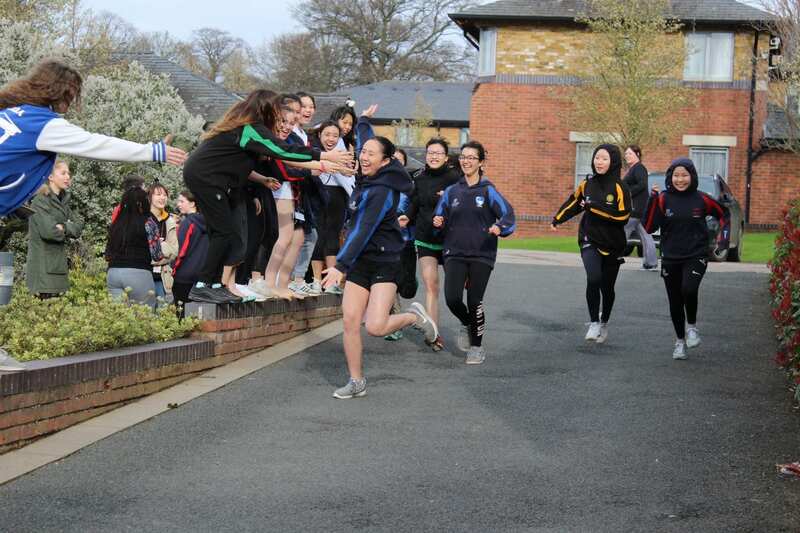 Last Wednesday was Concord’s inaugural House-Triathlon event – an ‘exciting’ addition to the Wednesday games programme and annual House Competition. The triathlon debuted last year for Lower School students (Form 3 and Form 4, with optional inclusion of Form 5), and was thoroughly enjoyed. This year, available to the entire school, an impressive 215 students signed up to participate either as individuals or in teams of three, for a challenging afternoon of running, cycling and swimming. Concord’s organiser of the event, Mrs Julia Kerslake said: “It was a fabulous event and an amazing turnout, considering there were school trips happening too. “Sixty teams and a further 35 individuals entered, and all the students kept smiling despite the cold wind and mud.” Students were required to complete a course comprising of a 1-mile run to and around Concord’s Hall Meadow, followed by a 2-mile cycle also on Hall Meadow. Afterwards, students had to run back to the swimming pool and complete a 400m swim (25 lengths). For students competing as part of a group, they also had to transfer their wristband to their teammate at each stage of the event. Amidst the showers of rain and heavy wind, students performed admirably in a highly fun and competitive afternoon of sport. Following the triathlon, Concord’s four houses were ranked based on overall time across all events, leaving the final standings as follows: 1st (8pts) PANKHURST - 6h 41m 49s 2nd (6pts) MANDELA - 6h 45m 24s 3rd (4pts) TERESA - 7h 1m 28s 4th (2 pts) GANDHI - 7h 21m 22s Many congratulations to Pankhurst, the overall winners. Mrs Kerslake added: “A huge well done to all involved. Thank you too, to all of the staff, lifeguards and other students who supported and helped to prepare for and officiate the event. “It would not have been possible without you.” “The next big house events to look forward to include the swimming gala and sports day, both taking place in May.” For a full list of individual and team winners from the triathlon, click here. To view the photo gallery, click here.